At 1423 on April 29, 1945, Ensign Kōzō Koizumi took off from Kanoya Air Base as pilot in a Zero Fighter Trainer carrying a 250-kg bomb and died in a special (suicide) attack off Okinawa at the age of 21. He was a member of the Kamikaze Special Attack Corps 5th Shōwa Squadron from Yatabe Naval Air Group in Ibaraki Prefecture. He was from Kanagawa Prefecture, attended Yokohama College of Commerce, and was a member of the 14th Class of the Navy's Flight Reserve Students (Hikō Yobi Gakusei). I think that tomorrow we in the Shōwa Unit also finally will receive an order in the OO  No. OO Operation. As long as the enemy task force does not appear again, we will make sure-hit taiatari (body-crashing) attacks on enemy ships where they are at in the anchorage at Nakagusuku Bay or Kadena Bay at the main island of Okinawa, and we will destroy them completely. Under a dim oil lamp with all of my preparations completely finished, I am writing my final letter with a peaceful feeling. Please imagine me as Father's son standing calmly and full of self-confidence. It is best that you have no worries at all concerning me and that you be at ease. Finally, I deeply thank you for your kindness to me. I pray for your health and for great joy for the Koizumi Family. The letter comes from Kitagawa (1983, 186-7). 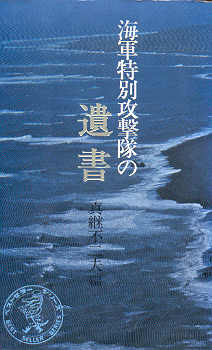 The biographical information in the first paragraph comes from Kitagawa (1983, 186) and Osuo (2005, 204). 1. The OO indicates that the information could not be shown in correspondence to civilians, since it was considered a military secret.